After Joe Girardi recently proposed his idea to move the home plate umpire to behind the pitcher's mound to call balls and strikes, Joe West responded via the umpire union's Twitter account, shooting down Girardi's claim that an umpire's view from behind the catcher hinders the ump's ability to accurately discern pitch location. Girardi simulates pitch calling from the mound. 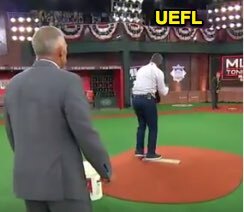 Monday night on MLB Network, Girardi explained his proposal, claiming that umpires can better officiate the issue of balls and strikes from behind the mound than from behind the plate because the unobstructed view from the middle infield allows an umpire to see the entire plate, as opposed to a catcher blocking out the umpire from seeing a corner or lower height. MLBN's Studio 42, for reference, where Girardi conducted the Diamond Demo, is not regulation size. 97.3% average. And what happens during the remaining 2.7% of the time? As manager of the New York Yankees, Girardi was ejected 20 times for arguing balls and strikes, but only 25% of these ejections were because the umpire had actually made an incorrect call; the umpire was still right a majority of the time. Of those 20 ejections, 15 concerned pitches that were correctly officiated, meaning that Girardi was in the wrong 75% of the time (2/2 in 2008, 1/2 in 2009, 2/2 in 2010, 2/2 in 2011, 2/3 in 2012, 1/1 in 2013, 1/2 in 2014, 2/2 in 2015, 1/1 in 2016, and 1/3 in 2017). That's five meritorious ejections in 10 years.